We understand the huge impact of social media on all of the online businesses. Moreover, we try to utilize this potential in our product to facilitate engagement and communication between website visitors and LiveChat operators. 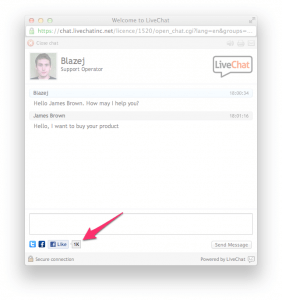 Introduced several months ago, the social media icons in the chat window quickly became a very popular feature amongst both small and large companies using online chat on their websites. Now we went a bit further and by adding Facebook ‘Like’ button to the chat window we turned it into almost a generator of Facebook likes. Every visitor in the chat session will be able to click the FB Like button and join your fan page. This will make your fan page messages displayed on the walls of your new fans and allow you to continue the communication with them even after they leave the chat window and your website. 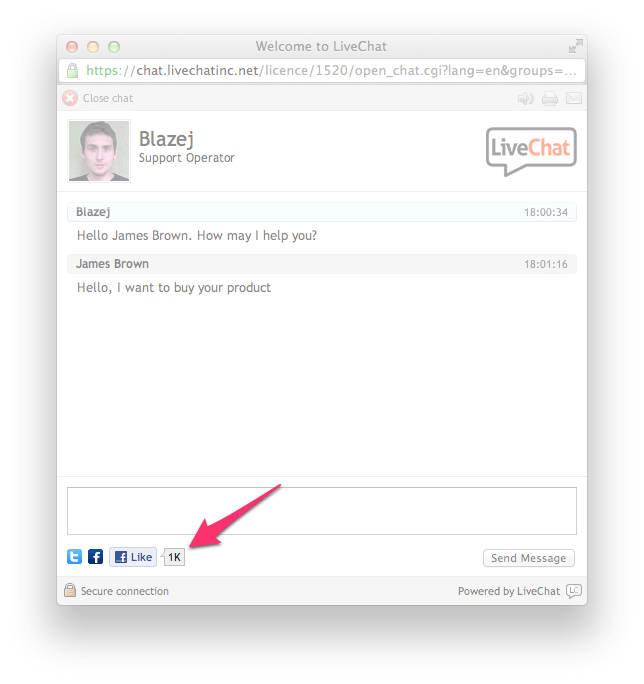 FB Like button can be activated in the chat window settings in the control panel – all you need to do is add your Facebook fan page address and the chat window will display both link to your fan page and the ‘Like’ button.